Central Assembly Family Life Center- 1202 W. Oxford Ave. 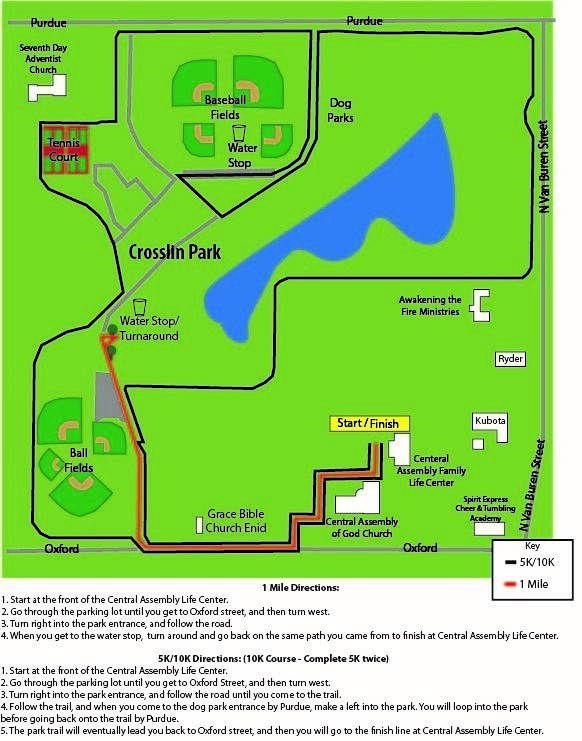 Early packet pick-up is on Friday, March 29th from 9:00am-6:00pm at the Central Assembly Family Life Center, 1202 W. Oxford Ave.
Race day packet pick-up and registration will be on the morning of the race from 7:00am- 8:15am at the Central Assembly Family Life Center, 1202 W. Oxford Ave.
*$5 will be added to fees for participants who register on race day. Participants who pre-register by March 15th will receive t-shirts in packet. Race day registrants will receive shirts as supplies last. Northern Oklahoma College BCM building- 201 S. Jenkins St.
Out and back course. Manual timing. Early packet pick-up is on Friday, April 5th from 3:00pm- 6:00pm in the NOC BCM building, 201 S. Jenkins St.
Race day packet pick-up and registration will be on the morning of the race from 7:00am- 8:15am at 201 S. Jenkins St.